Although chiropractic is effective in providing patch-up or pain relief treatment, we have found correcting the spine offers long-term benefits. This is why our chiropractic office specializes in principled chiropractic care. Thanks to technological advances and a new understanding of the spine and nervous system, we are now able to correct the spine and use before and after x-rays to document this change. These changes are achieved through a series of specialized gentle adjustments. The task of the chiropractor is to identify the underlying cause of a person’s health challenge and to correct it. 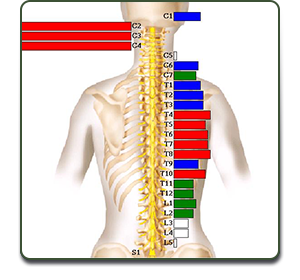 A condition of the spine known as vertebral subluxation interferes with the body’s natural ability to heal itself. A vertebral subluxation may sound complex, but it’s the technical way of saying there is a misalignment of the spinal column. Principled chiropractors locate vertebral subluxations, thoroughly analyze all of its components, design a specific program of adjustments and exercises to correct vertebral subluxations, and most importantly, help you and your family learn how to achieve a state of optimal health and how to maintain a healthy spine into the future. To fully appreciate and understand this difference and the importance of principled care, let’s start by looking at the difference between “symptoms” and “warning signs.” The difference is best understood through a simple comparison. If a person sprains their ankle and they experience pain in their ankle, this is a direct relationship. The location of pain and the location of the injury are the same. This is a classic example of a symptom. However, if a person is suffering from heart disease and is experiencing pain into their left arm, there is likely nothing wrong with the left arm! But arm pain is a classic warning sign of heart problems. It would seem quite silly – even foolish – to spend a tremendous amount of energy and resources treating a person’s arm pain when the cause of this pain is coming from the heart. Very similarly with the spine, if a vertebral subluxation is affecting the spine and causes pressure on the nerve going to your leg, over time you may begin to experience leg pain (commonly called sciatica). If we were to examine and treat the leg, we would be doing so in vain as this was a warning sign telling us of the problem in the spine. Depending on which nerve(s) in the spine is being affected will depend on what type of warning sign(s) we may experience. Fortunately or unfortunately there is often a significant time delay between the onset of subluxation and the first warning signs. This is because of our bodies amazing ability to adapt to both its internal and external environment. For example, if you have a pebble in your shoe, you don’t lean on it, you lean off of it; your body behaves very similarly in relation to vertebral subluxation. If you are experiencing a vertebral subluxation, the warning signs can manifest in a variety of different ways throughout the body. Chiropractors look at the spinal column and nervous system as a unified system that extends throughout the body, which helps give us a better understanding of how a feeling of pain in your leg or arm could actually be a warning sign of something wrong with the spine. Chiropractic care offers a non-invasive way to treat vertebral subluxations and other joint misalignments to provide you with natural pain relief. But, before we can get to treating your pain, we have to figure out what that source of pain actually is. During your first visit, we will talk with you about the aches and pain you feel as well as any other symptoms you may have noticed. We will also do a thorough chiropractic examination, including x-rays and other scans, to see what is going on in your body. From there, we will craft the right treatment plan for your body’s specific needs. The spinal column is comprised of three main elements: the bones, the spinal cord and the nerves that extend from it, and the spinal discs in between each bone. The bones of the spinal column protect the spinal cord and nerves, and the discs are what allow the spine to shift and move in multiple directions. However, things like poor posture and repeated actions can cause the bones of the spine to shift and press unevenly on the cushioning discs in between. This can cause a spinal disc to bulge and press on the spinal cord or on nerves. Since nerves are the intra-body pain transmitters, this is why spine misalignment can cause pain — and cause it throughout the body, not just in the physical location of the subluxation. Even something as simple as sitting on a wallet in the same pocket every day can slowly shift your hips — and by extension, your spine — out of proper alignment. As you can see in the images above, posture and alignment issues can seem minute in one part of the body, but that small misalignment can affect the entire body. A small alignment issue at the ankles or hips can affect your posture from foot to head. That can be enough pressure, over time, to cause your spine to shift and subluxations to occur. Of course, subluxations can occur from a wide range of other causes, including falls, impact, whiplash, and so on. Chiropractic techniques are designed to gently and naturally help bring misaligned joints back into alignment. This can relieve pressure on the spinal cord and any nerves that are being affected, and it can also help ease tension for the muscles, ligaments, and other soft tissue that help support a joint’s function and range of motion. However, it’s important to note that chiropractic isn’t a one-and-done quick fix. We don’t just click your spine back into alignment and call it good. Instead, it generally takes a series of regularly spaced adjustments to help ease misaligned joints and give that area a chance to heal and strengthen. We can typically provide natural pain relief from the beginning, but it’s likely going to take multiple sessions to experience the full benefits. Chiropractic care can help with a wide range of different ailments — including some you may not expect! There are the expected ailments, like whiplash or and chronic back pain, but chiropractic care can also help with everything from sports injuries to pregnancy aches and even allergies. 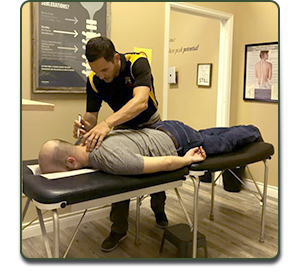 You can explore a more extensive list here, but the overarching point is that chiropractic care can help with such a variety of different issues because we focus on the whole body, not just one small portion of it. To learn how we can help with your back pain, neck pain, or to see if chiropractic care can help with any other ailment you might be experiencing, start with a consultation. Connect with the Revelation Chiropractic team in Fort Collins to learn more.